There’s nothing like the pull of a fish when you hook up, whether it’s a striped bass, dolphinfish, marlin or other gamefish. Adrenaline flows. Eyes focus. The brain screams, fish on! Landing the catch on slick-calm water, perhaps with a picturesque coastline within sight, doesn’t hurt, either. 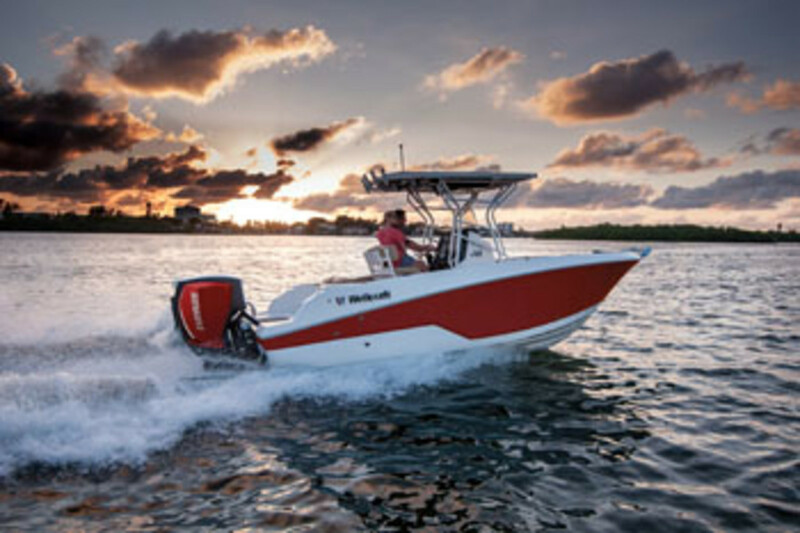 There are dozens of fishing boats out there, from 16-foot skiffs with 50-hp outboards to offshore convertible battlewagons that top 90 feet and are powered with twin diesels that pump out combined horsepower in the mid-four-digits. But the lion’s share of fishing is done from boats in this spectrum’s lower half — those from about 20 to 40 feet. 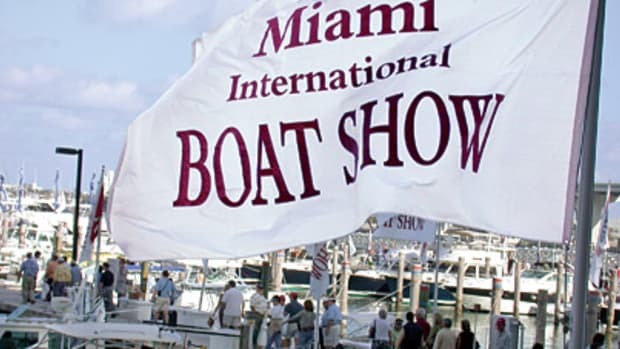 The Miami International Boat Show (held in February) is one of the best venues to size up the latest fleet of fishing boats. Center consoles dominated the docks again this year, all equipped with the essentials — live wells, macerating fishboxes, rod holders and more. These are designed to be fished hard, but they also deliver the comforts and conveniences for beach hopping, cocktail cruises and gunkholing. 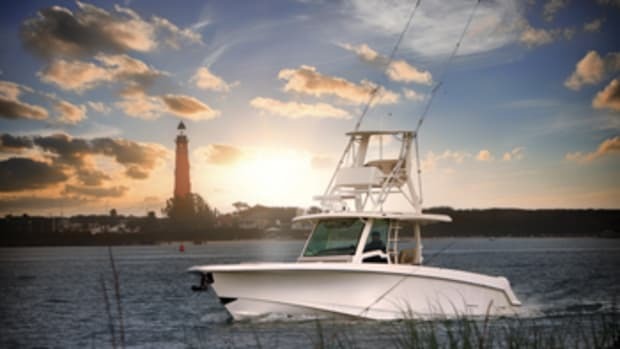 The boats are from such well-known builders as Boston Whaler, EdgeWater and Mako, and though they’re no longer the Spartan fishing platforms of 25 years ago, the loyalty to anglers is unmistakable. Sure there’s more seating, barbecue grills and dinette tables, but all of this quickly stows to clear the decks so you won’t waste time when you’re ready to wet a line. 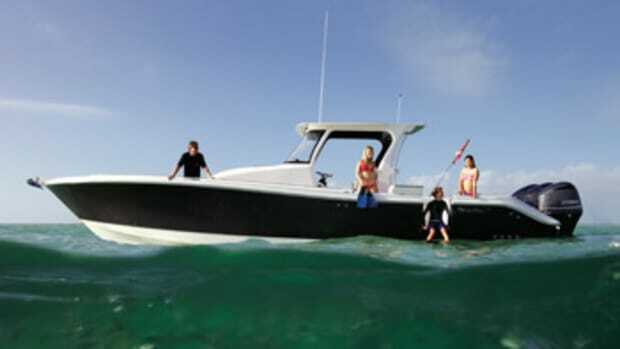 Mako doesn’t skimp on the fiberglass when it builds the 334 CC, the company’s new flagship and largest center console. “We’re heavier than others, following the Mako tradition of [building] tough, durable boats,” says senior project engineer Chuck Mooney. I sea-trialed the new boat at the Miami show. The 334 CC jumped out of the hole and leveled off quickly, so I never lost sight of the horizon. I took her through some sizable wakes and chop in Biscayne Bay, and the boat felt firmly planted, shouldering the waves nicely. 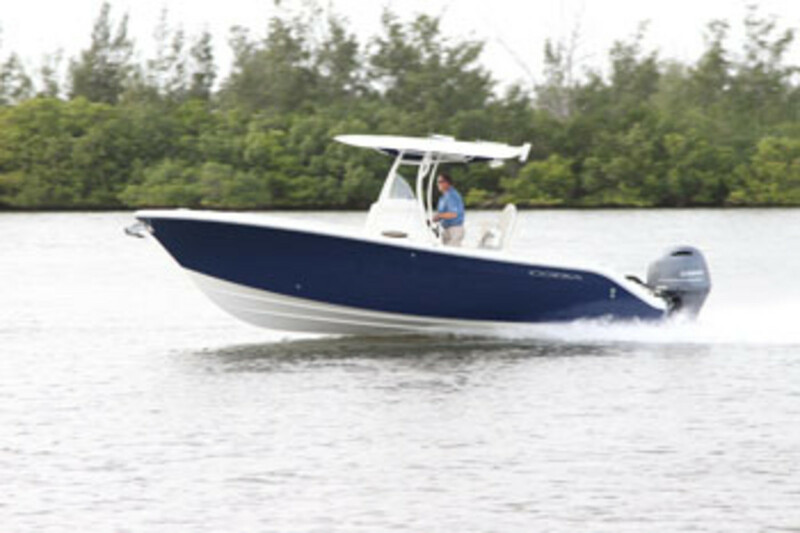 Triple Mercury Verado 350s pushed the Mako at a 40-mph cruise, with a mileage rating of 1.4 mpg. Anglers can equip the boat with a fishing package that includes a forward coffin box, outriggers, additional rod holders, dual live wells and a dual-pump sea chest. This new Outrage is a foot longer than its predecessor. Adding length to the hull without increasing the beam improved the boat’s head-sea ride and freed space forward for larger U-shaped bow seating. This area was a “little tight on the previous 250,” says Boston Whaler senior naval architect Bobby Garza. 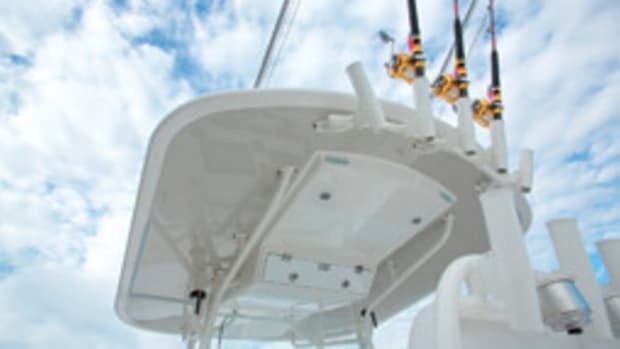 Below the waterline, the hull is based on the running surface of the 350 Outrage, “one of the best offshore fishboat designs in our recent history,” Garza says. The boat is packed with fishing equipment, including a live well in the leaning post, two fishboxes under the cockpit sole and a freshwater sink with tackle storage. You can add a second live well to the port side aft or trolling seats recessed in the port and starboard gunwales amidships. “This is a bigger, better 250,” says Garza. The Cobia 261CC’s in-deck fishboxes open wide so you can pitch your catch into them from all angles. It’s a small detail but indicative of the fishing features that the Maverick Boat Group includes. Company founder Scott Deal builds a variety of open fishing boats under the Hewes, Pathfinder, Maverick and Cobia brands. 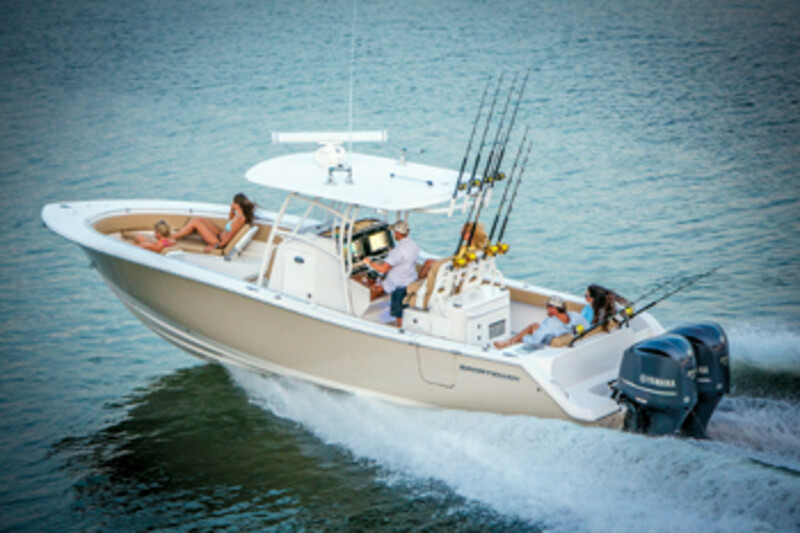 The 261CC sits in the middle of the Cobia center console fleet, which ranges from 20 to 34 feet. The forward seating is split so you can fish from the bow and access the anchor locker. 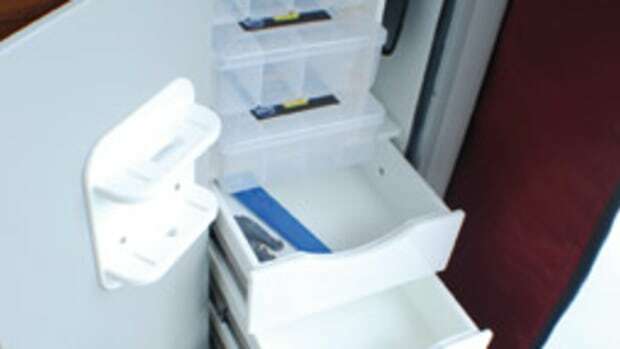 The boat comes with a live well and a leaning post tackle station, and customers like the console’s forward entry. “Side-door access can be tight, requiring a bit of contortion,” says director of marketing Charlie Johnson. “Here, you just walk right in.” There’s quick access to the batteries under the helm seats, and an electric-powered bilge door lifts with the touch of a button. Wellcraft tapped a few fishing pros to make sure its new center console was properly equipped in a logical layout. “You can never have enough rod holders, but they need to be both accessible and out of the way,” says Glyn Austin, a Florida fishing guide and Wellcraft consultant. “You need storage for fishing gear, but also dry spaces for whatever the family brings aboard.” Wellcraft delivered. 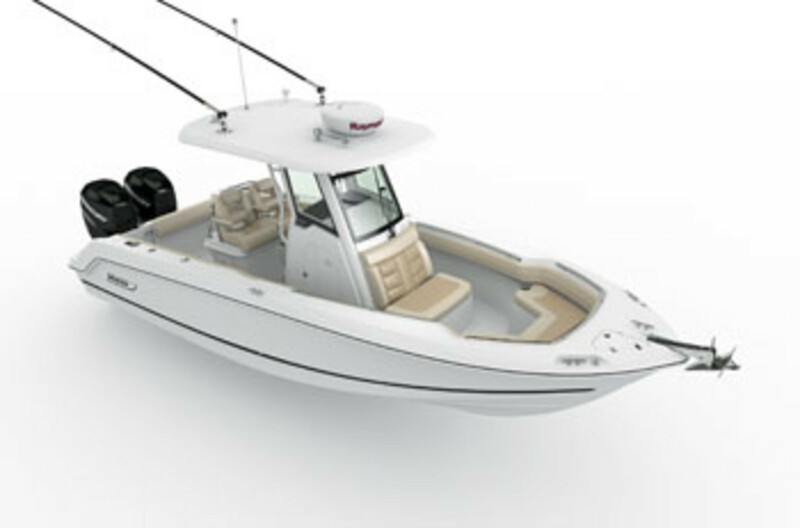 The 222 Fisherman has three foredeck storage compartments and a console head that can be used for storage. And it can be equipped with as many as 24 rod holders. The boat rides a deep-vee hull with ample forward freeboard and a deep cockpit. You’ll get 3 mpg from 25 to 37 mph with a single Yamaha F250. 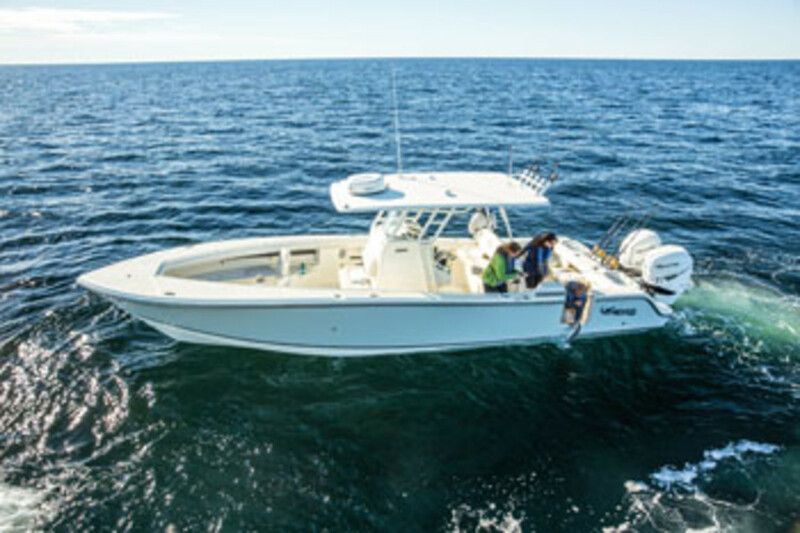 The Sportsman Open 312 is a formidable fishing and day-cruising center console. 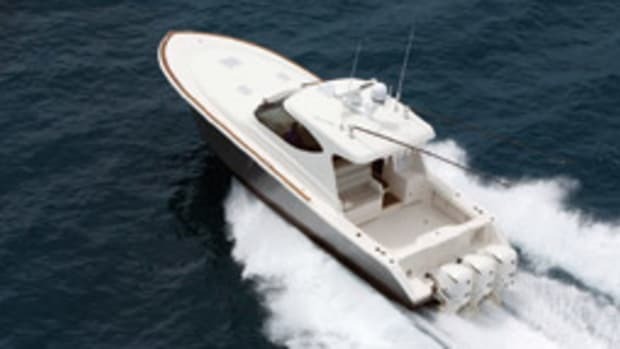 The boat is built by Tommy Hancock and Dale Martin, founders of Sea Pro Boats and Key West Boats, respectively, who teamed up to create Sportsman. The experience of these former rivals is evident from stem to stern on the Open 312, from the beefy hinges on the hull-side dive door to the twin forward-facing bow seats with backrests that transition through five positions. And the teak steering pod from Release Marine gives the boat some Palm Beach pizazz. The boat rides a deep-vee hull with 22 degrees of deadrise at the transom. There are rod holders scattered around the deck, and a pair of 30-gallon live wells anchor the cockpit. You can throw your catch into the two macerated in-deck fishboxes. I checked out StructureScan 3D sonar on a 27-foot center console in the Florida Keys. 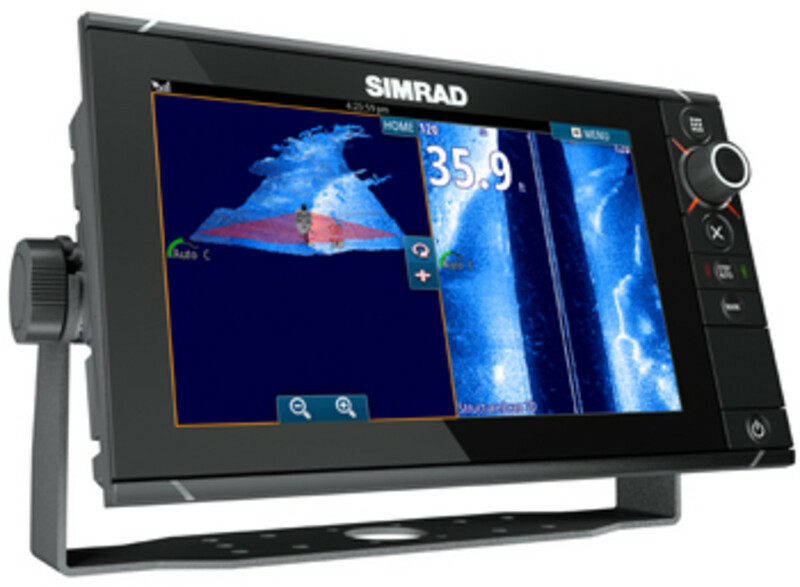 The 278 Dusky Open Fisherman was tricked-out with the latest electronics from Simrad. Two NSS evo2 touch-screen systems with 16-inch multifunction displays anchored the console. 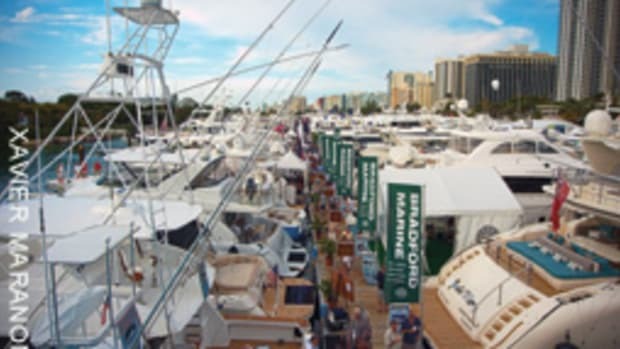 Each was equipped with StructureScan 3D, which won an Innovation Award at the Miami International Boat Show in February. Using one of the MFDs in split-screen mode, we had Structure-Scan 3D displayed on the bottom of the screen and StructureScan SideScan 2D on top. Nothing went unnoticed — neither rock nor ledge nor fish. Running a narrow channel, the display showed the bottom as we snaked our way through, and I saw a pod of bait along a ledge about 20 feet off the starboard side. StructureScan 3D requires an NSS or NSO evo2 system in addition to the $999 Structure-Scan 3D Skimmer transducer and module. Radar is another segment of marine electronics that has been developing rapidly. Raymarine, Garmin and Furuno have introduced systems that use more advanced solid-state technology. “Don’t let the darkness end your boating day — that’s the message we want to get across,” Jim McGowan, marketing manager for Raymarine, told me during a demo of the new Quantum radar. Raymarine Quantum radar features integrated Wi-Fi, CHIRP pulse compression, small-target detection and a lightweight design with low power consumption.